Posted in Tactical Gear on March 18, 2013 by Mike S.
Known for making “hard use knives” favored by lawmen, firemen, paramedics and the US Military, Emerson Knives, Inc. was a company born out of necessity. In 1978 Ernest Emerson needed a balisong (butterfly) knife for a Kali course and was unable to afford one. He borrowed a knife from his instructor, Richard Bustillo, over a weekend. Drawing upon his training as a machinist; he reverse-engineered it, in order to make one of his own. This started the current CEO of Emerson Knives' professional custom knife making career. Over the next 10 years, Emerson rose in popularity in the custom knife arena; particularly as a maker of Linerlock folding knives. Eventually he wedded the design of a chisel ground blade to a Linerlock and was noticed by a group of people claiming to be "underwater welders". The group turned out to be none other than members of SEAL Team Six, the Navy's elite counterterrorist unit. Emerson's custom knives became a hot commodity in the world of special operators and when word of these knives made it out to the general public it created a demand that could not be filled out of a custom workshop by a single Knifemaker. Having performed factory collaborations with Timberline and Benchmade knives for a fixed blade and folding knife respectively, Emerson saw a demand for mass produced renditions of his custom knives. 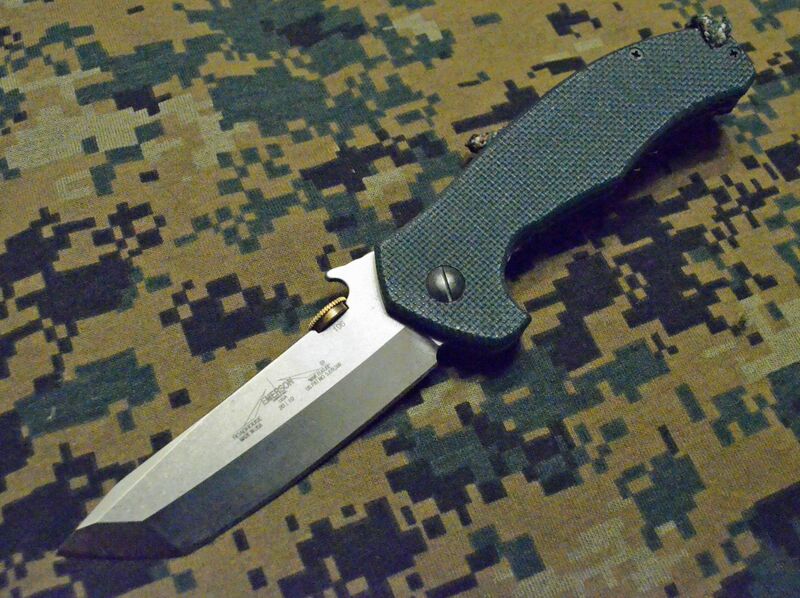 Add to that, the military requirement of issued-knives coming from a regular production facility as opposed to the bench of a custom maker; Emerson decided to build his own factory in Torrance, California in 1996. Emerson Knives, Inc. (or EKI) produces factory versions of many of Emerson's custom designs. Although most models are chisel-ground as opposed to the zero-grind found on the custom knives and use G10 scales instead of linen Micarta with a titanium bolster; the steel used in their construction (154-CM) and the shapes of the blades and contours of the handles are similar to the custom pieces. Although the custom knives made by Emerson for the US Navy SEALs receive the most glory and command the highest prices; it was the factory-made NASA knife that made its way to the US Space Shuttle and International Space Station Missions. With less than a dozen produced they may be some of the rarest factory models ever produced. One of EKI's greatest innovations has been the "wave-shaped opening feature". This is a small hook on the blade's spine that catches on the edge of a pocket and aids in opening the knife while it is drawn. Originally it was meant to be a blade-catcher on another knife designed for the US Navy SEALs, but in 1998 it made its way to most of the factory models. In going beyond the knife world, EKI has forayed into collaborations with firearms manufacturers such as Les Baer and Spike’s Tactical for a 1911 pistol and a series of AR15 rifles built with the founder’s input. In 2012, EKI moved their factory to a larger facility a few miles away in Harbor City, California. In addition to being able to increase production for the factory-made knives, Emerson has a dedicated training area to conduct courses in CQB, jujitsu and even run boxing clinics from time to time. Being the only tactical knife company to have a CEO who is a top custom Knifemaker and world-class hand-to-hand combat trainer keeps Emerson Knives at the head of the pack. Mike has worked around firearms his entire adult life starting as a Marine Rifleman at 17 and continuing as a gunsmith, ballistician, instructor, consultant and writer. An avid shooter and martial artist, he has written over 1000 articles about Mixed Martial Arts, boxing, knives and firearms for online media and print magazines such as RECOIL, Gun Digest's Tactical Gear, Blade, and SWAT.